Adding a family tree to the Appendix of your memoir or autobiography is a great idea, but a little tricky since space is limited. You can use a two-page spread as shown here, but still may need to create an abridged version of your family tree. If you want to make the complete version available, you might want to store it online on a site like Dropbox.com or Google Drive. If you already have a printed version of your family tree, work with your book layout designer to see if it will fit, or how it might be edited to fit into the printed book. Neatly draw your family tree on a single sheet of paper. Your drawing can be scanned or photographed and resized to fit into your book. Software. There many free and reasonably priced software options. Each of these programs offers many features in addition to creating the family tree chart, so your choice may depend on whether or not you have the desire to do additional genealogy research. Family Echo is a very easy to use free online tool that will create a basic names only PDF chart or printout. Family Tree Heritage is a reasonably priced software program that provides numerous options for printing a family tree. If you’re interested in working on your genealogy in-depth, you’ll find the tools for that in this program as well. 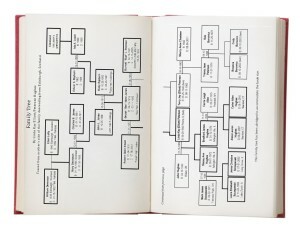 A family tree can be manually created with a graphics or page layout program if you have the technical skills. If you have used any family tree tools, let us know which ones and tell us how they worked for you in the comments below.